Physicists make for fascinating protagonists in the current Sydney theatre scene. 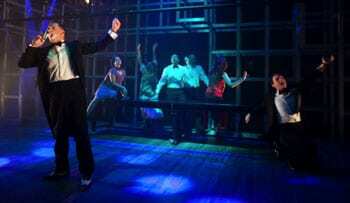 First with the Sydney Theatre Company’s production of Vere (Faith) and now with the world premier of Atomic the musical. Written by Sydney local Danny Ginges with Gregory Bonsignore and music by Phillip Foxman, Atomic is the new high energy rock musical that throws the doors open on a pivotal moment in history – the creation of the atomic bomb. Set in the 1930’s and 40’s, Atomic centres around the brilliant Hungarian Jewish physicist Leo Szilard (Michael Falzon), a previous student of Albert Einstein, who persuaded the US Government to develop the bomb before the Germans. With Szilard’s direct involvement – inventing the nuclear chain reaction, guilt consumes him, fearing the use of the bomb by the Americans could kill millions because of something he made. Ginges and Bonsignore have created a clever and richly textured script, weaving complex themes ranging from the treatment of Jews in Germany during the Shoah, to the ethics of nuclear weapons and American politics during the war. The concept of scientists as guardians of morality is central to the story, with the atomic bomb a potent symbol of power and world supremacy. The role of women as wives, mothers and workers during the war is also explored as well as one’s devotion to work at the expense of family and faith. Despite being called a rock musical, the score by experienced Phillip Foxman, with musical direction by Andy Peterson, incorporates a range of styles, including a moving Yiddish lullaby, sung beautifully by Lana Nesnas in Act 1 and Bronwyn Mulcahy in Act 2, along with an entertaining nod to the Andrews sisters in ‘The Holes In The Doughnuts’, a real highlight, with Christy Sullivan. David Whitney provides entertaining comic relief as the Italian philandering physicist Fermi in the Latino inspired, albeit cheesy, ‘America Amore’. The band was positioned above the stage and from the back row, the music occasionally drowned out the singing, though people in closer rows didn’t find this a problem. The cast is an impressive ensemble with a depth of experience. Michael Falzon’s mellifluous voice is superb as the intense and guilt-ridden Szilard and Bronwyn Mulcahy, as his wife Trude, is a real standout, with an exquisite voice and nuanced performance as the devoted yet deeply lonely wife. Blake Erickson and Simon Brook McLachlan complete the seasoned cast. This collaborative production brings together a talented team from Australia and America, with highly experienced New York based director Damien Grey providing an assured hand in realising this highly energised and creative production. The set, designed by New York based Neil Patel, is simple but effective, using a series of white Japanese style screens, used cleverly to double up as doorways and various transportation used to transition the characters between many locations and different cities. It was also an ever present symbol of the tragic fate of the bombing of Hiroshima. Authentic costumes by Emma Kingsbury along with impressive sound and lighting design, by Michael Waters and Niklas Pajanti respectively, add to a visually satisfying and skilful technical production. In shedding light on a virtually unknown figure in science history, Atomic the musical is original, entertaining and thought provoking and deserves to be seen. Thank G-d ( and Danny ) the show is not a bomb !! !